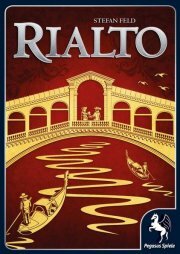 My impression after a first look through the rules: for a "Stefan Feld" game, Rialto looks almost too accessible. The board shows us clearly the six districts of Venice with a simple, somewhat uninspired design. Also, we can find a space for the twelve different kinds of building tiles and room for the currency (gold coins) and the councilmen of the players. Finally we find a scoring and a Doge-track on the board. 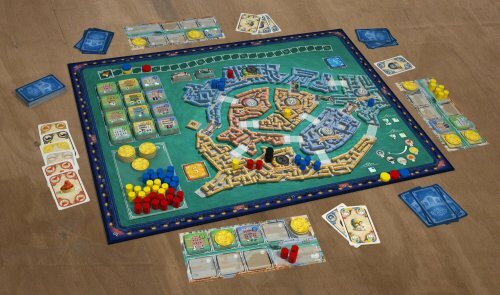 In addition to the main board, every player gets his own player board where the players' purchased buildings, their gold and their usable councilmen are stored. The main part of the game however takes place next to the board. Here, round after round, we lay out a number of card rows of six randomly drawn cards, equal to one more than the number of players. During the first phase of a round each player chooses one of this rows, adds two random cards from the draw-pile and takes these cards together with his leftover cards from the last round. After scanning through these cards the players reduce their hand to a size to seven cards. The next phase is the main part of the game. There are six different kind of cards that now can be played stage by stage. First of all it is the turn to play the red Doge cards. Beginning with the starting player, every player gets his chance to play as many matching cards from his hand as he wants. Per card played each player advances one step on the Doge track. This is quite an important element of the game, for the Doge track breaks all ties and defines the regular play order. For all stages it is deeply interesting to be the player with the most played cards, because a bonus is given for it. For example, in the first stage the player who has played the most cards may take one additional step on the Doge track. Here you can see why it is so essential to be in front of the Doge track, for it also solves the tie for the most played cards. The regular benefit of the Bridge stage are victory points (+1 for every card played). The bonus however puts the winner of the stage in the position to place a bridge on the main board to connect two districts. These bridges determine how valuable a district becomes in the end and so they are most important for the final scoring. In the Gondola stage the players get new councilmen from the general supply. Again there is a special bonus. Similar to the bridges the winner places a gondola tile to a free connection between any two districts. In comparison to the bridges the value of the district only increases slightly. But there is another big advantage by playing a Gondola. The player immediately may place one of his free councilmen onto one of the two districts he has just connected. This is the only possibility to place councilmen to districts that were already dealt with. To understand all this, we must have a closer look to the last stage of phase 2. In this councilman phase, the player may put a councilman for every matching card from their own supply to the current district. The order of the districts is drawn at the beginning of the game. Every round another district is the current one, so after six rounds all districts are dealt with and the game ends. Then a final scoring takes place. On the one hand there are general victory points for the leftover councilmen and coins and for the purchased buildings. On the other hand, now the districts are evaluated. According to the rank, who is determined by the number of each players' councilmen, the player who is in front gets the total value of all adjacent bridges and gondolas in each district, respectively half of this value for the second rank and again half of this value for the third rank. Now that you have had an overview about the main elements of the game, you might ask for what you need the money and those buildings for... The only function of the money is to activate a building. Every building in the possession of a player can be activated once in a round. For this, the player must spend one of his coins. All of the 12 different buildings have their own function and can be activated in a specific phase of the game. Green buildings can be activated after all players have taken a turn. Those buildings either enable the player to take more cards and/or to keep more cards in hand for this round. Especially the last function is very helpful to have a wider variety to react on the opponents actions. Yellow buildings can be used in phase two and affect the player's possibilities to play cards. More important for the game are the blue buildings, since they can be activated after phase two and give the players victory points, councilmen or let them advance further on the Doge track and exchange buildings from their boards with other , more valuable buildings. The simple rules let us think of some kind of family game, but after your first round you will see that Rialto is after all still a "Stefan Feld" game. So, everything you do is important. Players should always exactly know what they are doing, why they choose the one or other row of cards, when to buy the one or other building and which plan they want to pursue. It is not that a single mistake at the beginning of the game seals your fate, but two or three of these mistakes and you will not have any chance to win the game any more. At the beginning, the number of cards the players have to deal with is, at least to my mind, a bit overwhelming. If you use the special function of the green buildings, you easily end up with twelve or more cards at the end of phase one. These cards have to be reduced to seven cards (if you do not have another green building, you can use) and especially for new players this is a formidable challenge. Again, it is important to plan your moves and so it is quite important to decide whether you should keep more Doge cards or more Gondola cards in this stage of the game. On the other hand, Rialto has a moderate game duration of about 45 minutes, and this normally should incite players who have become familiar with the game to an instant replay. Quite astonishingly for a game with well-working rules, playtesting with different groups revealed that Rialto sometimes does not seem to awaken enough enthusiasm to try it again. The reasons for this are diverse: the boards as well as the game box are kept in a very functional design. I really have no objections to a simple design, but in Rialto this looks a little bit out of place. Only the illustrations on the cards are able to keep up with modern games, the rest of the game seems to come straight from the 80's. I fear that it is this missing atmosphere which is responsible for the aversion of some people to play another round. And then, on the other hand, Stefan Feld's mechanisms seemingly are not innovative enough to win players' hearts right away. That is a pity, because the game offers a surprising variation of strategies to win and thus becomes more and more interesting round after round. This is not least because the randomly drawn card rows in phase one force the players to permanently rethink their strategies. And these pauses for reflections are delightfully short for a "Stefan Feld" game. In the end I would say that Rialto is not what you would call a "must buy", but it is still a game of satisfactory quality. Only be sure that you are able to persuade the other players to do another round, since otherwise many of the good things of the game will be lost because the players needed the first game to get familiar with the mechanics.